G4-73/Y4-73 Centrifugal Fan/Induced Draft Fans are primarily applicable to steam boilers with capacity of 2-670t/h in power plants for air ventilation and inducing. If no special requirements, G4-73 blowers also apply to mining ventilation and general-purpose. 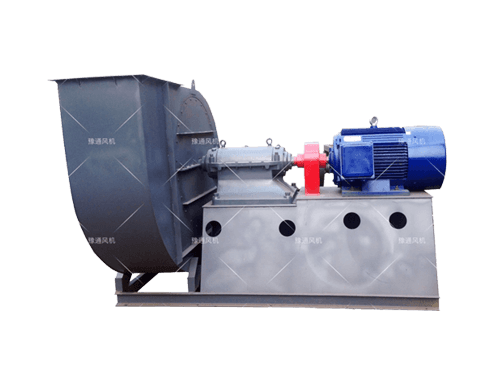 The medium for G4-73 ventilation fans should be air of no more than 80℃; the medium for Y4-73 induced draft fans can be smoke of no more than 250℃. A dust removal device has to be added before the induced draft fans to minimize the dust content in the fans. The efficiency of dust removal devices should be no less than 85% according to the requirements of general power plants. 1. Impeller — It consists of 12 backward curved airfoil beveling blades welded between arc cone front disc and flat plate back disc. The airfoil blades ensure blowers’ high efficiency, low noise and high strength. All impellers pass static and dynamic balance correction and over-speed running test, so they enjoy stable and reliable operation. Impellers of ventilation fans and induced draft fans with same model No. apply the same structure different raw materials (generally speaking, A3 for ventilation fans and 16Mn for induced draft fans). 2. Casing-It is welded into a volute shape with common steel plates. Casings for single inlet blowers can be made into three different types (Casings for Blower №8～№12 can be made into an integrated non-separable structure; casings for blowers №14～№16 can be divided into two parts while casings for blowers №18～№29.5 can be divided into three parts). For induced draft fans, volute plates are appropriately thickened to prevent wearing from dust. 3. Inlet — To be integrated into a convergent streamlined structure and fixed onto the suction side of the blower with screws. 4. Air damper- The air damper is used to adjust the capacity of blower and radially installed before the air inlet. The adjusting range is from 0° (fully open) to 90° (fully closed). Looking from the side of the air inlet, the handle of the air damper is on the right side. For right rotation blowers, the handle moves from fully closed to fully open by moving from bottom to top. For left rotation blowers, the handle moves from fully closed to fully open by moving from top to bottom. 5. Driving unit — The main shaft of the driving unit is made of quality steel. Rolling bearing are used for this blower series. There are two kinds of bearing boxes: blowers with №8~16 apply integrated cyclone-type bearing boxes while blowers with №18~29.5 apply two separate pillow block bearing boxes. Bearing boxes for Y4-73 induced draft fans are equipped with thermometer and oil level indicator. The bearing box uses 30# motor oil. The oil amount to be added shall be based on the oil level indicator. If using grease lubrication, integrated cyclone-type bearing boxes for blowers with №8~16 should add an oil baffle plate on the side of rolling balls inside the bearing box and the slot for fixing the oil baffle plate is already reserved. Y4-73 induced draft fans are equipped with water-cooling devices. Therefore, a water pipe has to be added and the water consumption varies with ambient temperature and is usually considered as 0.5-1m3/h.